Hey, keep it down out there! 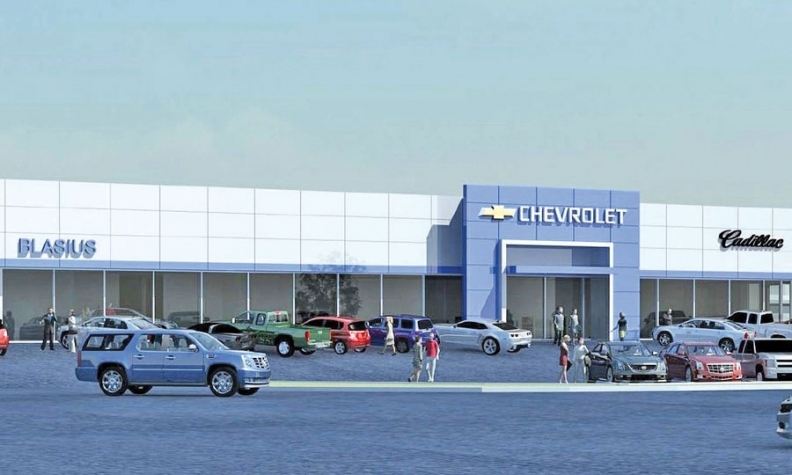 Rendering shows how Blasius Chevrolet-Cadillac in Waterbury, Conn., will look after the renovation. To keep distractions in the F&I office to a minimum, much of the renovation work is being done on weekends and after business hours. Curry Honda's Howard Sackaroff says he keeps two bottles of Advil on his desk. The dealership is in the midst of a $4.5 million renovation. And Sackaroff doesn't want business disrupted during construction -- least of all the finance and insurance office, where privacy is critical. Fortunately, Sackaroff planned ahead so he hasn't had to pop any pain relievers yet. "We skirted around the issue of moving into trailers," says Sackaroff, general manager of Curry Honda and Curry Nissan in Chicopee, Mass., about an hour's drive west of Boston. "We chose to do it in stages where we can move various departments to various parts of the dealership while the construction goes on." Many dealerships face massive renovation projects that stir up dust and dirt and involve noise from jackhammers and other tools. Amid that chaos, some dealers must find a comfortable, private and quiet place to take customers to conduct the highly sensitive business of financing a vehicle and pitching various insurance products. Those dealers who have been through complex renovations recommend doing the construction in stages or after business hours if possible. And most important, they say, is to make sure the contractor understands the significance of the F&I office so that construction crews can work around it. "Let's face it, the F&I office is your cash flow," says Darrell Neilander, finance manager at Blasius Chevrolet-Cadillac in Waterbury, Conn. "That's got to be protected by all means." At Blasius the F&I office has been mostly unaffected by renovations on the store, Neilander says. The owner started construction in March. Blasius' owner chose to have much of the work done on weekends and after business hours, Neilander says. "He thought ahead," Neilander says. "They're doing one side of the construction, and that is all separated from us. We don't hear anything, very little. They'll complete that section and we'll all move into the completed section while they do the showroom. So it won't affect finance and sales." The only disruption has been that construction on the service area is driving more people into the showroom area. "So obviously you have to be a little quieter because there are more people around, and this is private stuff," Neilander says. "But that's it." Neilander says if he had to worry about construction going on around him all day, it would take his mind "off the game" and he would struggle to properly service customers. The preparation that Blasius Chevrolet-Cadillac did is quite different from Chris Walsh's experience. Walsh was a finance manager and later the general manager at Newman Chevrolet in East Hartford, Conn. He worked there from 1983 to 2005. In 2003, the owner started major renovations on the store, Walsh says. But no one stopped to consider where to put the finance manager's office, Walsh says. "There was a lot of noise and dust from the renovations," he recalls. Walsh knew he had a problem when "my F&I manager, who was the nicest guy in the world, came into my office and said, 'I can't work this way anymore.'" Walsh says he also had a couple customers say, "I can't concentrate." "We didn't have anybody walk out, but were people distracted? Yes, absolutely." Walsh portioned off an alcove near the back of the showroom for his finance manager. It was a solution he calls "a Band-Aid." "Had we thought about this prior to doing the construction, we wouldn't have put him there," Walsh says. "I never want to go through it again. Contractors need to know that F&I is so important because it's a legal issue. Once contractors know that, they often comply." Walsh, now president of the Vets-Cars Group in East Haddam, Conn., an association of dealers whose goal is to give superior service to military veterans, advises dealers to be prepared to move the F&I office at least once during construction. And dealers should meet frequently with the contractor. "It needs to be communicated to the contractor that the F&I office is not only one of the biggest revenue makers, but due to compliance and regulations the fact that it has to be quiet and private is critical," Walsh says. He adds: "A well thought out plan starts with the F&I office. As dealerships undergo widespread store renovations, protecting the privacy of the F&I office is critical and requires creative solutions. • Plan ahead so that construction is done in increments in other parts of the building. • Communicate with the contractor to ensure F&I office privacy during construction. • Be prepared to move the F&I office at least once during major renovations. • Consider using a trailer as a temporary space if that provides enough privacy. Penske Automotive Group Inc. did 25 store renovations or new construction projects last year in the United States and United Kingdom, says Tony Pordon, a Penske spokesman. Often Penske rents trailers where the dealership staff can conduct business while the main dealership is undergoing renovations, Pordon says. "The first renovations we did, we probably had some struggles in terms of the size and the shape and where we put people," he says. "We've refined the process and learned over time." Penske ranks second among Automotive News' top 125 U.S. dealership groups with total new-vehicle retail sales of 154,829 in 2011. While trailers have worked for Penske, Sackaroff vehemently opposed the idea for Curry Honda. "We were worried about security and space," he says. "The salespeople would be on top of each other. Even if you get a big trailer, there's still congestion. And the trailers are not secure like a building is." Curry Honda sells about 1,500 new and used vehicles a year. Sackaroff says it has cost more to renovate in shifts than to rent a trailer. And it likely has added a month to completion time. But he says it was "well worth it doing it this way." Sackaroff keeps a spreadsheet on his wall that shows each step in the renovation process. Every Tuesday at 10 a.m. he meets with the construction company's foreman and the architect to go over every detail of the upcoming week's renovations to forestall any problems. "It's not negotiable. You can't stop doing business while this goes on," Sackaroff says. "Many people have told me that business either stays the same or it gets better when you're doing this the right way." He adds that since starting renovation in August 2011, "amazingly, our customer satisfaction scores went up."